The Illinois Department of Transportation isn’t all bad, but it sure seems that way sometimes. Earlier this year, my blogging partner Steven Vance broke the story that IDOT has been blocking the Chicago Department of Transportation from installing protected bike lanes on state-jurisdiction roads. The motives behind the ban aren’t clear yet, but documents the Active Transportation Alliance obtained via a Freedom of Information Act request suggest that, contrary to the state’s explanation, concern for safety isn’t one of them. Also this year, IDOT rammed the Circle Interchange Expansion through the regional planning process. The project will make room for more cars in the West Loop’s “spaghetti bowl” junction of the Ryan, the Ike and the Kennedy. While this $475 million boondoggle promises to do little to relieve congestion, it will discourage transit use, and its three flyover ramps will degrade the pedestrian environment and lower property values. Now IDOT is pushing to build the Illiana Tollway, a $2.75 billion expressway running south of the urbanized Chicago region, which would serve relatively few drivers in the foreseeable future but would compete with transit projects for scarce transportation money. Representatives from CDOT, CTA, Metra, Pace and the Regional Transit Authority recently voted yes or abstained from voting in a referendum on moving the project forward. That seems absurd, until you realize that IDOT has the power to block or delay federal funds to these agencies, so they can’t afford to ruffle the state’s feathers. It might be unfair to stereotype the typical IDOT staffer as a suburbanite or downstater who’s indifferent to quality of life issues here in Chicago. However, the state does generally seem to prioritize moving cars in and out of the city quickly, which largely benefits people who don’t live here, over creating livable streets for the folks who do. I heard about yet another example of this phenomenon last week at an Active Trans workshop on improving pedestrian access to the Blue Line’s Addison station, located in the median of the Kennedy in Avondale. 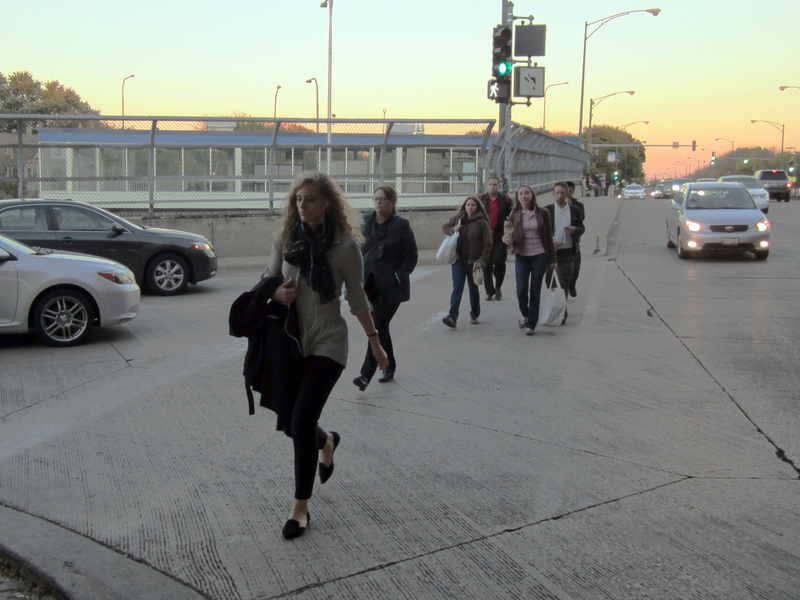 The El stop averages 2,867 boardings a day, but the surrounding area is a nightmare for pedestrians, with narrow sidewalks crisscrossed by four expressway ramps. Approaching from the southwest is particularly difficult. For the entire half mile of Addison west of the station, there are no marked north-south crosswalks where walkers are protected from fast cars by stoplights or stop signs. Good luck getting the speeding drivers to obey the state law requiring them to stop for pedestrians in the crosswalk. About fifteen people show up for the workshop, including a staffer from freshman State Senator Jaime Andrade’s office, plus aldermen Ariel Reboyras (30th Ward) and Rey Colón (35th Ward), nattily dressed in a fedora. Reboyras says a new stoplight is needed at the convoluted intersection of Addison, Avondale and Lawndale, just west of the expressway, so that people on foot can safely make the north-south crossing. Active Trans’ Riders for Better Transit campaign manager Brenna Conway takes us on a tour of the surrounding intersections, bus stops, and the station itself, asking for input on what people like and dislike. When we get to Addison/Avondale/Lawndale, everyone agrees that a stoplight is sorely needed here. “There’s a videogame where you try to go out in the street, like Donkey Kong,” says an older guy. “Frogger?” a woman responds. “Yeah, that’s what this feels like,” he says. Afterward, Rodger Cooley, who teaches urban agriculture at IIT and lives southwest of the station, gives me the real dirt on the traffic signal situation. In 2003, CDOT told Reboyras they’d approved his request for the stoplight at Addison/Avondale/Lawndale and had found funding to install it in 2005. In 2004, after a driver killed Luis Cruz, 14, on his bicycle, two blocks west at Springfield Avenue, there was new interest from residents in creating a safe Addison crossing. But the signal never materialized, and the alderman and the community never got an explanation why. A FOIA request filed by another community member last March revealed that the culprit was—wait for it—IDOT. The FOIA documents included a 2005 letter from IDOT Deputy Director of Highways Diane O’Keefe explaining to CDOT why the state was putting the kibosh on the stoplight. “The proximity of the Avondale Avenue intersection to [another stoplight with no crosswalk at] the Kennedy Expressway exit ramp is too close to prevent backups between the two signals and onto the exit ramp.” In other words, the safety of pedestrians was considered less important than the convenience of drivers. Last January, State Senator Iris Martinez’s office checked in with IDOT on this issue again. Deni Wilson from the department’s Office of Legislative Affairs responded via email, also included in the FOIA. “Before a new traffic signal can be approved along a state highway… it must be determined that the new signal installation will not adversely affect the safety and efficiency of the roadway for all users,” Wilson wrote. The problem is, when it comes to the safety and efficiency of the roadway, IDOT seems to believe that motorists are more important than everyone else.